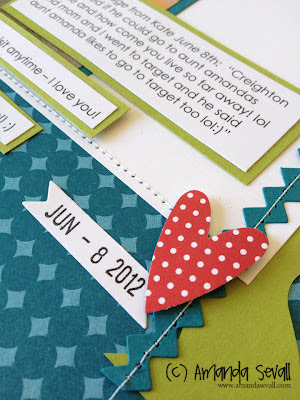 Amanda Sevall Designs: Scrapbook Layout: Love This Kid! Had to scrapbook it of course! Used a July PageMaps sketch (the one at the top!) and my Summer Smooches Designer Series Paper. Love how this turned out -- so glad to be back in my scraproom! Yea! So happy to see you scrapping! This layout is fabulous! The journaling is awesome and oh so cute. Thanks for sharing your page with us Amanda! Loveeeeee this! Loving the colors and the heart!! !